Ran over to Richmond again today on the spur of the moment to squeeze in a little more research. Today, I visited the Morrisson-Reeves Library. I reviewed the oldest directory, 1857, and the next few, plus some of the older plat maps. My big find? In the 1863 directory, I found a listing for a ‘Mary Brenker’. No other Brenkers before or after in the directories I checked. In my post about Paul Mayer, I noted his second wife was Mary Breiker. Her last name, however, is illegible on both her headstone (due to age and wear) and on their marriage license and Breiker was the closest I could get. Could this be the Mary who Paul married? It is of note that I placed her address on an 1854 map, and it is equidistant from where Paul lived and worked. Interesting! ETA: I also checked for similar spellings of the surname, especially Brinker. 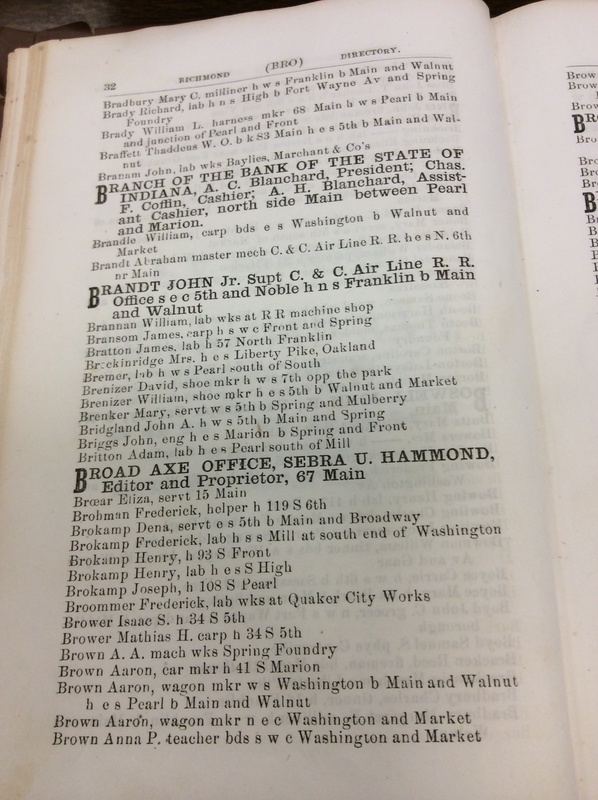 Out of the directories I checked during that time frame, I found one Brinker in 1870, none before. Her surname on both the headstone and marriage license appears to have an ‘i’ in the middle so I am leaning toward her surname being Brinker and the Brenker in the directory was a misspelling. I can’t even begin to count the number of ways that Paul Mayer’s surname was spelled in the directories, the censuses, etc. !